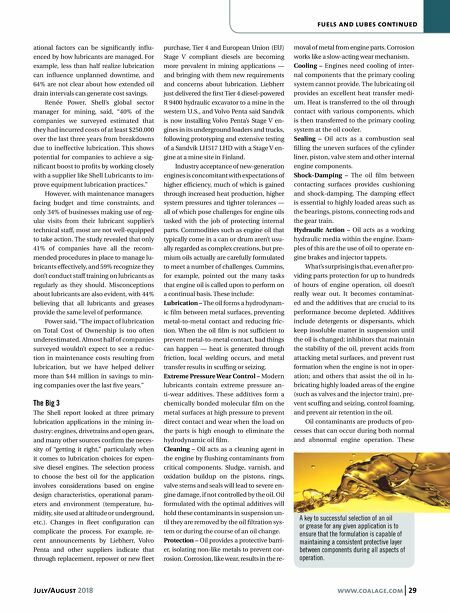 28 www.coalage.com July/August 2018 fuels and lube Capture Savings Through Better Lubrication Management Recent studies suggest that mine fleet operators aren't taking maximum advantage of lubrication technologies and services to reduce operating costs by russell a. carter, contributing editor Although it never appears in line entries on corporate balance sheets, annual operat- ing budget estimates, or even daily perfor- mance summaries, friction is a steady drag on the industry's drive for cost containment and productivity improvement. Last year, a paper published in a well-known technical journal attempted to calculate the econom- ic losses resulting from friction and wear in mining — and the numbers are big. * The study estimated coefficients of friction and wear rates of moving me- chanical assemblies based on available information taken from literature in four general cases: (1) an average mine in op- eration today, (2) a mine with today's best commercial technology, (3) a mine with today's most advanced technology, and (4) a mine with best futuristic technology forecast in the next 10 years. The calculations indicated that the cost amounts to roughly €210,000 million annually, distributed in the proportion of 40% for overcoming friction, 27% for pro- duction of replacement parts and spare equipment, 26% for maintenance work, and 7% for lost production. The authors suggest that by taking advantage of new technology in friction reduction and wear protection for min- ing equipment, friction and wear loss- es could potentially be reduced by 15% in the short term (10 years) and by 30% in the long term (20 years). In the short term, this would annually equal world- wide savings of €31,100 million, 280 TWh (terawatt hours) energy consumption and a CO emission reduction of 145 million metric tons (mt). In the long term, the annual benefit would be €62,200 million, 550 TWh less energy consumption, and a carbon emission reduction of 290 million metric tons (mt). Potential remedies to re- duce friction and wear in mining include the "development and uses of new mate- rials, especially materials with improved strength and hardness properties, more effective surface treatments, high-perfor- mance surface coatings, new lubricants and lubricant additives, and new designs of moving parts and surfaces." 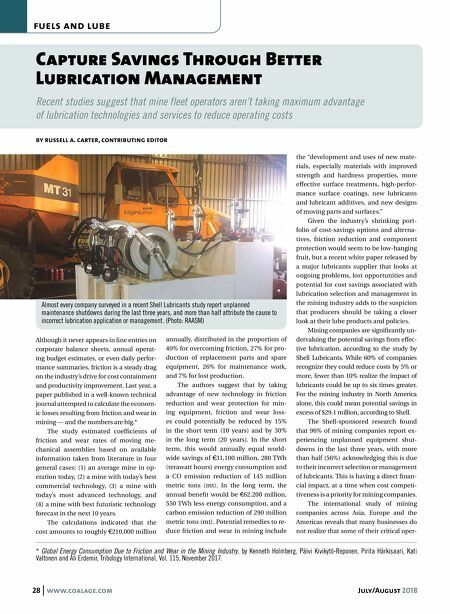 Given the industry's shrinking port- folio of cost-savings options and alterna- tives, friction reduction and component protection would seem to be low-hanging fruit, but a recent white paper released by a major lubricants supplier that looks at ongoing problems, lost opportunities and potential for cost savings associated with lubrication selection and management in the mining industry adds to the suspicion that producers should be taking a closer look at their lube products and policies. Mining companies are significantly un- dervaluing the potential savings from effec- tive lubrication, according to the study by Shell Lubricants. While 60% of companies recognize they could reduce costs by 5% or more, fewer than 10% realize the impact of lubricants could be up to six times greater. For the mining industry in North America alone, this could mean potential savings in excess of $29.1 million, according to Shell. The Shell-sponsored research found that 96% of mining companies report ex- periencing unplanned equipment shut- downs in the last three years, with more than half (56%) acknowledging this is due to their incorrect selection or management of lubricants. This is having a direct finan- cial impact, at a time when cost competi- tiveness is a priority for mining companies. The international study of mining companies across Asia, Europe and the Americas reveals that many businesses do not realize that some of their critical oper- Almost every company surveyed in a recent Shell Lubricants study report unplanned maintenance shutdowns during the last three years, and more than half attribute the cause to incorrect lubrication application or management. (Photo: RAASM) * Global Energy Consumption Due to Friction and Wear in the Mining Industry, by Kenneth Holmberg, Päivi Kivikytö-Reponen, Pirita Härkisaari, Kati Valtonen and Ali Erdemir, Tribology International, Vol. 115, November 2017.